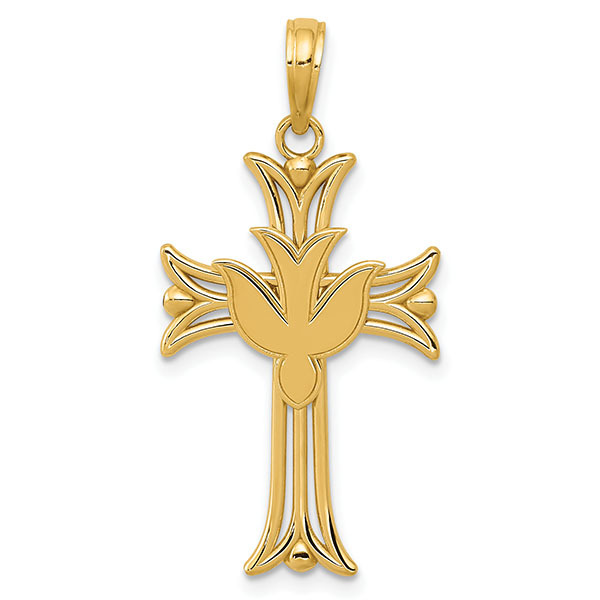 The Holy Spirit in the form of a dove adorns the center of this beautiful and feminine cross pendant for women in 14k solid gold, from Apples of Gold Jewelry. The cross measures approx. 15/16" tall x 17mm wide (or 1 3/16" tall with the hoop). Add a matching 14k solid gold box chain to make it a dove cross necklace (optional). This cross is made in the U.S.A.! "Howbeit when he, the Spirit of truth, is come, he will guide you into all truth: for he shall not speak of himself; but whatsoever he shall hear, [that] shall he speak: and he will shew you things to come" (John 16:13). We guarantee our Holy Spirit Dove Cross Pendant for Women, 14K Gold to be high quality, authentic jewelry, as described above.